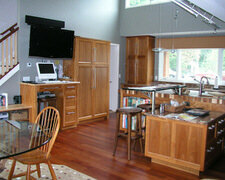 Armoire De Cuisine R Al Soucy Ent is your One stop shop for your complete kitchen or bath renovation. Armoire De Cuisine R Al Soucy Ent is a complete kitchen and bath company specializing in design, supply and installation of mid to high-end residential kitchens and bathrooms. Catering to both retail and design clientele our knowledgeable staff is available to assist you in planning your kitchen or bath renovation.